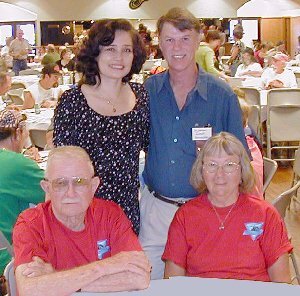 The celebration of the 50th Anniversary of the 1955 Hummer was held at AMCA Davenport 2005. 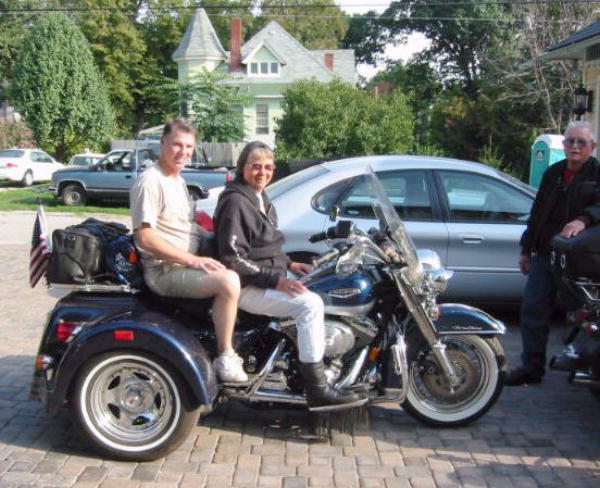 Dean and Priscilla Hummer headed east from Petaluma, California. On motorcycles. 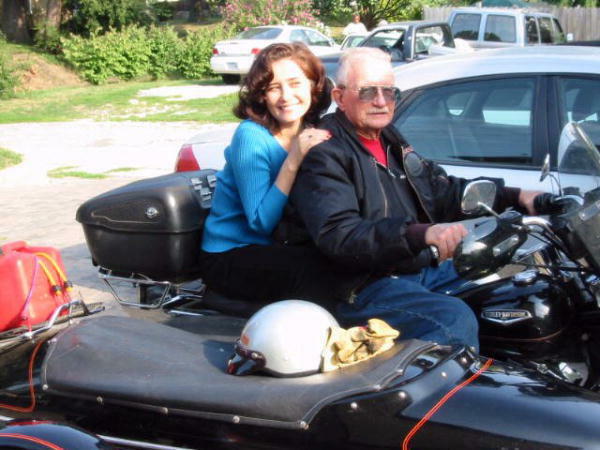 Dean and Priscilla are both in their 70's, yet riding motorcycles halfway across the country to an event was something they just do. Jim and Mary Godwin loaded up Jim's collection of every year and model of Hummer (29 in all) on a tractor trailer in Mendon, Ohio, and set out in a north-west direction. Dave and Jennifer Hennessey loaded up Dave's 1955 Hummer in their pickup truck in Bethesda, Maryland and headed west. The three couples converged in Davenport, Iowa, where a huge 75' x 75' party tent awaited. The Chief Blackhawk Chapter (aka Wanda Schumacher) somehow arranged for the Hummer Club to occupy 8 contiguous vendor spaces in prime swap meet territory. Wanda, thank you. A Huge Success! 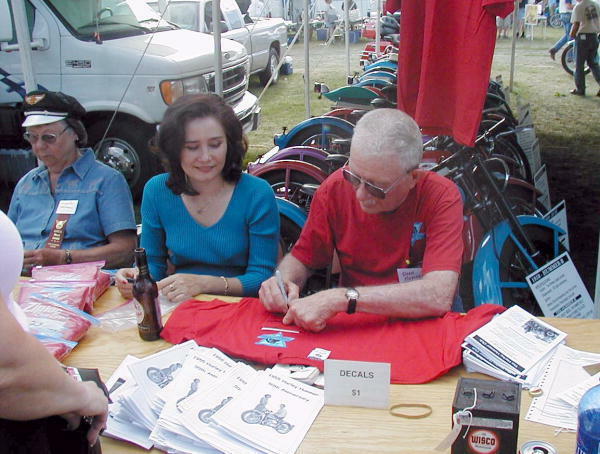 Thousands of people toured the Anniversary Tent which housed Jim & Mary's display of every year and model Hummer, along with poster displays of period Hummer advertising, and a huge poster of the congratulatory letter from the Secretary of the United States Department of Transportation. 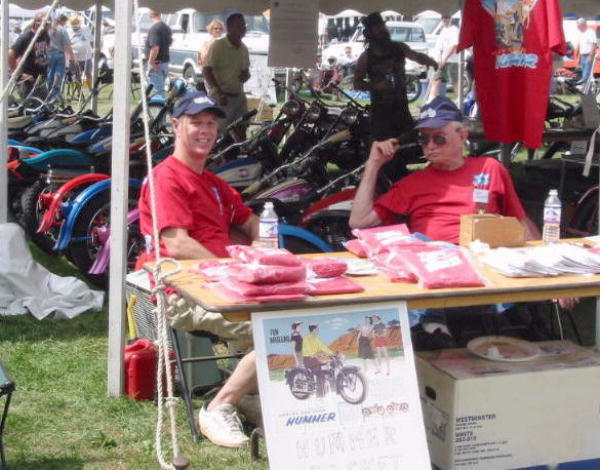 Dean wore out his pitching arm signing Hummer T-shirts, Hummer memorabilia, and even a motorcycle tank or two! Priscilla Hummer and Jennifer Hennessey sold every last one (about 100) of the Club's red T-shirts. Next door, Jim and Mary Godwin watched their new and repro Hummer parts just fly off the shelves. A film crew from "Corbin's Ride On" TV show showed up. They took footage of the Anniversary Tent, and taped interviews with Dean Hummer and Jim Godwin. The segment appeared on the Speed Channel in 2006. Wrapping up the weekend's festivities at the AMCA's Saturday Night banquet, held in the beautiful Starlight Ballroom, Del Schumacher, Chief Blackhawk chapter president, introduced Dean and Priscilla, and Dean gave a short speech to the assembled enthusiasts. The fun continued on Sunday morning. Jim Godwin's moving crew discovered a problem - "We counted 29 motor-sickels when we left Ohio. Now we're leaving Davenport, and we've got 30 of these durn things." 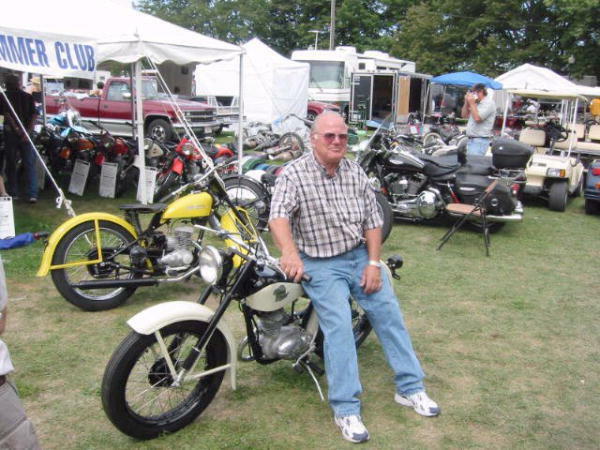 Frank Helin dropped off his Hummer at the Aniversary tent on Saturday, and arrived bleary-eyed on Sunday at noon - to find his motorcycle gone. Fortunately, it was only 5 or 6 rows back in the tractor-trailer, and Frank was able to retireve it before it hit the road to Ohio. (1) Did you spot Wanda Schumaker in the video? (2) Can you spot Mutt in one of the still photos?